Let's recap my favorites from this week. 1) We had a delicious dinner at Giovanni's ( Raylan's favorite place) on Saturday to celebrate Raylan's first week of school. As usual, the food is always great and Raylan loves playing the games in the party room. 2) This school week started out rough with Raylan crying on Monday not wanting me to leave him at school. However, Tuesday was much better with no tears at all. He hasn't cried any after Monday and has had a great school week. 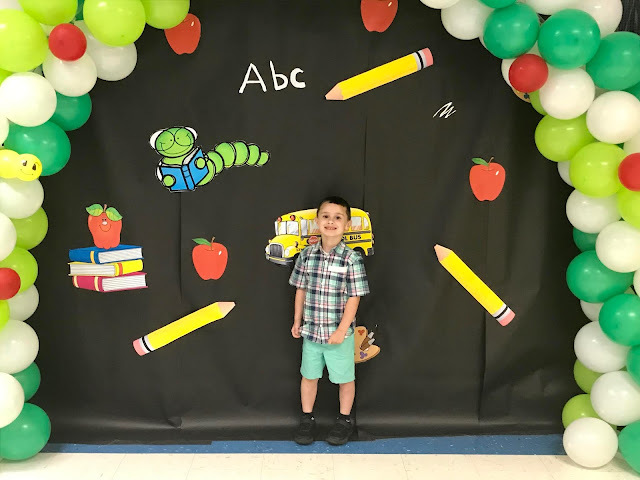 I think he is really enjoying school now and gets eager to go. 3) On the days of no tears, I have treated Raylan to an ice cream afterwards. That has been a win for us both. He loves going to the ice cream shop. We have been trying to keep him excited about school and give him something to look forward to. 4) I made my first ever BBQ Chicken Pizza on the grill and it was absolutely delicious. Even my picky husband approved of it and said that it tastes just like it came from a restaurant. Look for me to share the recipe on the blog soon. 5) I have already started decorating for Fall and Halloween. If you know me at all, you know how much I love Fall. I always decorate for Fall early and for Christmas too. I just love the Ber' Months! How is it that August has already came and almost gone in a blink of an eye? It's like we only had a half of a month with everything being so hectic. 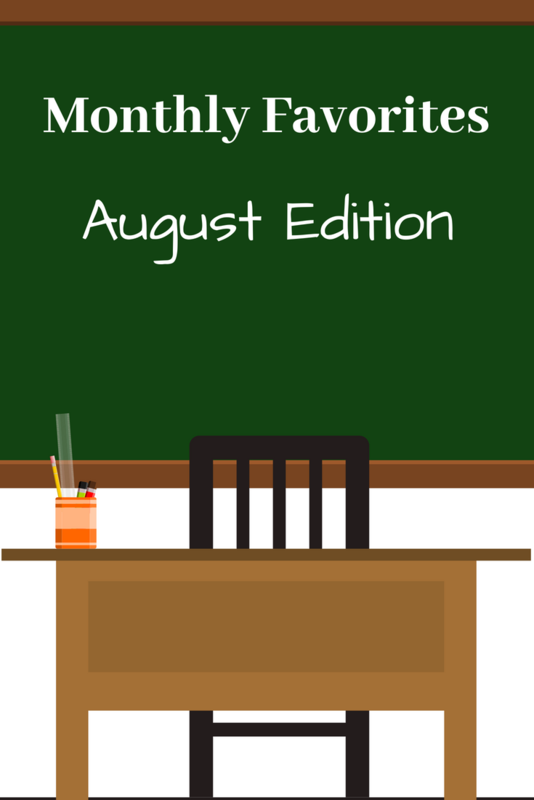 August brought about a lot of change with school starting for Raylan and me beginning a Substitute Teaching Position. Although It's been a great month, I'm getting excited for a new month. September is my birth month and it officially starts my favorite season of all which is Fall. So let me recap some of my favorites things and happenings from August before it ends. Justin and I managed to actually sneak in a date day. Those have been very few this summer due to sickness in Justin's family. How did August treat you? Did you do anything fun? I have a very important topic that needs to be discussed. It's one that has weighed on my heart for quiet sometime. It's the topic of mom shaming. Yes, mom shaming really is a thing. You always hear about people shaming moms for whether or not they breastfeed, but you don't hear much about other mom shaming issues. I myself never really gave mom shaming much thought until I was shamed. Let me just say, people can be so cruel and hurtful even when they think they have good intentions. I get so tired of seeing and hearing other moms be so judgmental and hurtful. It needs to STOP! It doesn't matter if you delivered a baby naturally or had a C-section, either way you still gave birth to that precious baby. It also doesn't matter if you adopt, you are still their mom. God blessed you with that child for a reason. It doesn't matter if you have one child or ten. It doesn't matter if you breastfeed or bottle feed your baby, as long as the baby gets fed. It doesn't matter if you choose to vaccinate or not to vaccinate your child. It doesn't matter if you co-sleep with your child or put your child in a crib. It doesn't matter if your child threw a tantrum in the store. It also doesn't matter if you work or stay at home, you do what you have to do for you and your child. It also doesn't matter what school you choose to send your child to or if you homeschool your child. It doesn't matter if you choose to send your child to head start/preschool or if you wait until they get into kindergarten to send them. You know what is best for your child. After all, you are their mom. Everyone else's opinion is irrelevant. It also doesn't matter if your house is squeaky clean or if there are toys all over the floor. It also certainly does not matter how much money you have. What matters is that your child is shown love every single day. That you spend time with them and be present in their lives. Make time for them. They are the most important thing in your life. That you are there for them. That you feed them, even if it is through the drive thru a lot of days. That you teach them to be kind to everyone they meet. That you raise them to realize that they are no better than anyone else. That you teach them to treat everyone with respect. That you teach them to be good a decent person. That you teach them to always lend a helping hand and do their best to help someone in need. That you teach them to do their very best in life, and if they fail teach them to try again. It also matters that you be understanding and supportive. That you teach them to be brave and courageous. Praise them when they do good and correct them when they are wrong. Teach your children about God. Teach them right from wrong. Teach your children to be positive. Listen to your children and speak words of encouragement to them. Laugh with them, give them hugs. Also raise a child that doesn't have to recover from their childhood. Give them a good and happy life. Most of all, love them unconditionally. That is what matters the most! God gave that child or children to you. He didn't give them to someone else. He specifically chose you to be their mom. God knew what those babies stood in need of and how well you can mother them. No one else could take care of them the way you can, so that's why he chose you to be their mom. There is no such thing as a perfect mom. We don't always have it all together. Most of the time we are one big hot mess, but that's ok. Our children still love us anyway. Your child doesn't care what you are or what you do or how much money you have, they still love you anyway. Each mom has different abilities and different children. Each situation is different than someone else's. Each mother has to make a choice that is different than another moms. Each mom has to decide what is best for their child and for themselves. Do not ever look down on another mom and make them feel like they are doing motherhood all wrong. If you have the opportunity to be a mom, just know how blessed you are. Live your life for you and your children. Live your best life and let your kids be happy. There is no such thing as a perfect mom. We are all doing the best we can. Being a mom is the most important job in the world and the most rewarding job ever. Stop the bullying and judging and just let other moms enjoy motherhood. 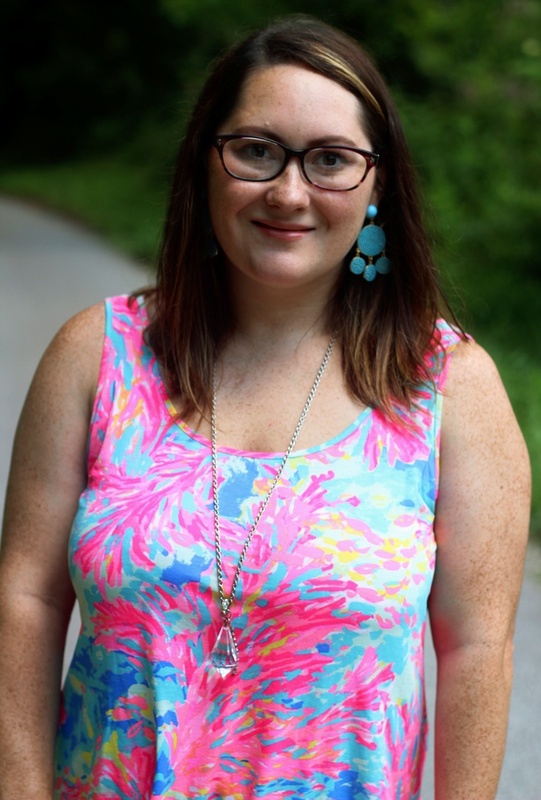 Stop making moms feels like they are less than. They are enough! Let them be happy! It's that simple! 1) Raylan started Head Start on Monday. I seriously can't believe my baby is already such a big boy and old enough for school. Every morning has been lots of tears but once he is there and the tears stop, he really enjoys himself. I have loved hearing all about each day. It's amazing what all they learn in a single day. 2) I had my first substitute teaching assignment this week. I really enjoyed teaching 1st grade. I'm looking forward to more wonderful classes. It's nice to be back to work again even though it is a big change for me since I haven't worked in a while. 3) I took Raylan to watch Christopher Robin this week. It was such an adorable movie. I have always loved all of the Winnie the Pooh stories and movies. 4) On Saturday, we took Raylan out and enjoyed the day with him as a family before school started Monday. We ate at one of our favorite BBQ places and of course Raylan had to go get a new toy. It was just a wonderful day. I wish we had more family days like that but life gets so busy sometimes. 5) The last two days the weather has been absolutely perfect. We have had cool mornings and evenings and it has felt just like Fall. I'm so excited for Fall! I've even had my first Pumpkin Spice Cappuccino this week. Lately life has been more than a little hectic. 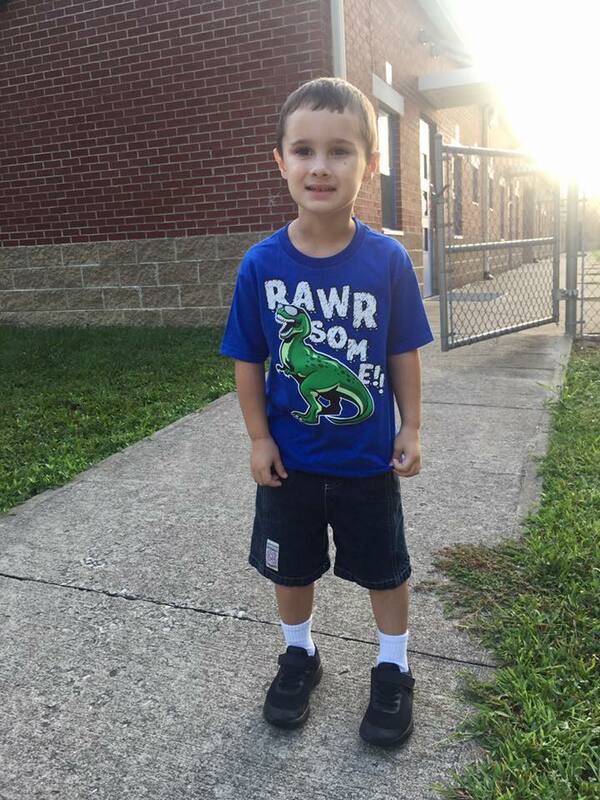 Raylan began school this week. 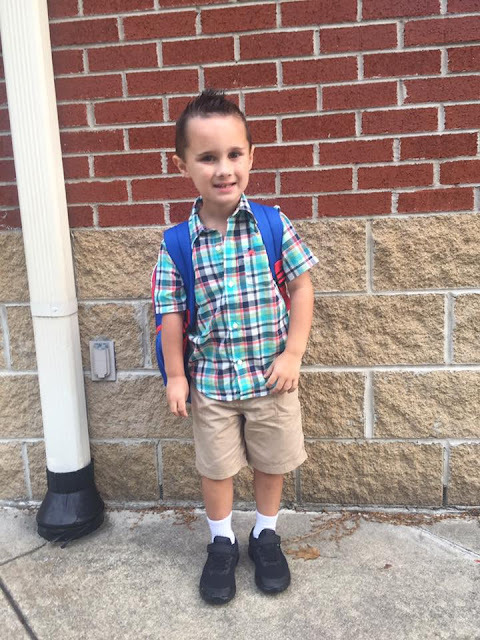 Our big boy is now in his first year of Head Start/Preschool. I'm pretty sure that I cried more tears than he did. He's our only child so this has broke my heart. It's so hard to watch your baby grow up and not need you as much, but at the same time it's exciting to watch him grow and see all that he will learn and do. I love how he was so excited to tell Justin and I all about his first day. It really is amazing to see what all they can learn in just the very first day of school. Monday was such a bittersweet day. I hope that he always stays excited about school and continues to have a love for learning. 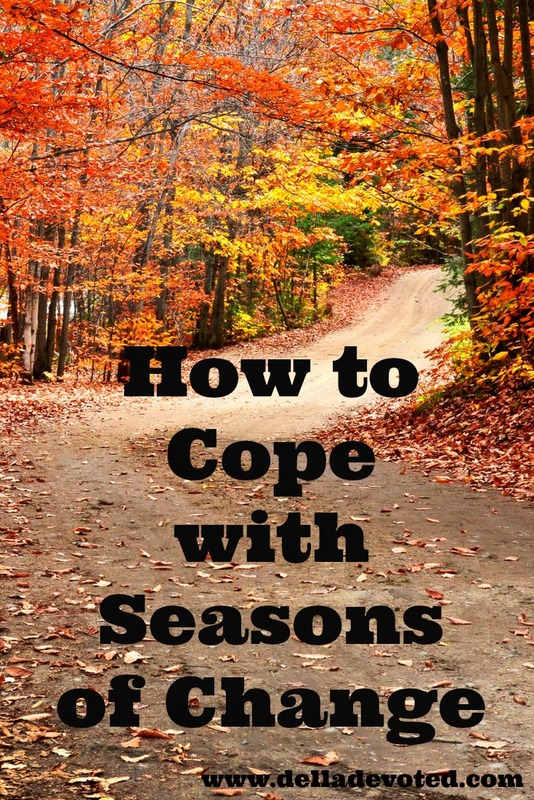 Are you going through a difficult season or experiencing many changes in your life? Did you make plans but God had different plans for your life? Just know that you are exactly where you are meant to be! We may not understand it but God knows what is best for us and he wants us to remember these 7 things. Eventually in life, we all fall into a season where change is inevitable. Don't blame yourself, life happens. Take time to pray and read God's word and allow it to change you and your way of thinking. It's very important to keep God in the center of our lives everyday, not just when we need him. He wants us to completely trust in him and lean on him. When plans change or don't go as planned don't lose hope. There is a reason why you are not able to go to the next step. Maybe, just maybe God is setting you up for an even better season. God knows exactly what he is doing and is with us every step of the way. He is paving a much better path for us. God opens a door that only he can open. 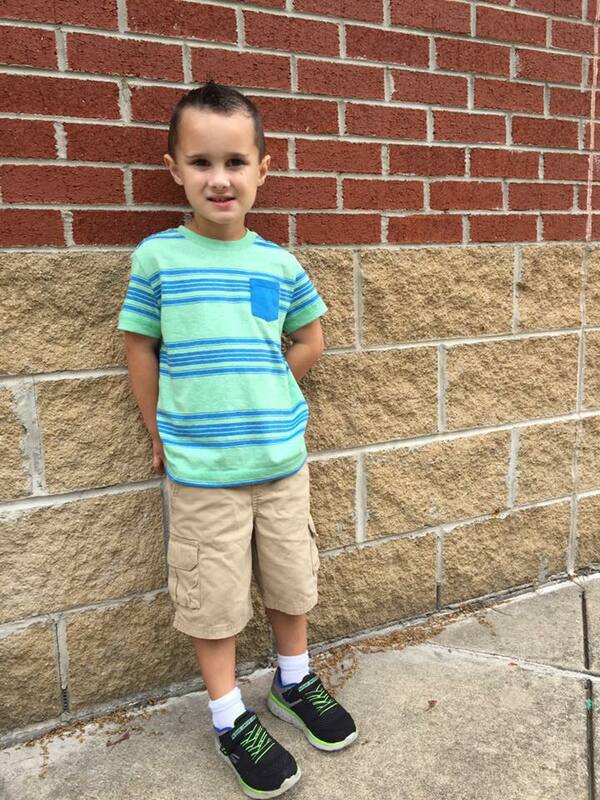 1) Raylan attended Open house for School. At first he was overwhelmed, but then he ended up enjoying himself. He was ok once he got warmed up to everyone and got to see his classroom. He says he is excited to go now. He starts Monday. I really hope he loves it and stays excited to go. Pray for this momma. I know I will be a total mess. 2) Our church had a cookout and waterslides on Saturday. It was so much fun! I always enjoy being around my church family and all of the fun events that they have. 3) Raylan got to watch his daddy race some over the weekend. Now that he is old enough, he loves to try to help Justin. He says he is a race car guy and part of the pit crew. I love watching Raylan cheer his daddy on. 4) I am officially on the Substitute Teaching list now. I'm excited and nervous to be back working. Many changes are coming mine and Raylan's way with him starting school and me working part-time, but I know if I stayed home while he's in school I would be bored out of my mind. Y'all I love S'mores! Like I really really love s'mores. My husband and my closest friends can attest to this. My favorite thing to do during Summer and Fall nights is sit around a fire roasting marshmallows and making S'mores. They really are my favorite sweet indulgence. My husband doesn't care much for them, so I often make them in the microwave as a small snack for myself. However, a person can get burnt out on eating the same things over and over again. So, I like to switch things up a bit to keep things from getting boring. 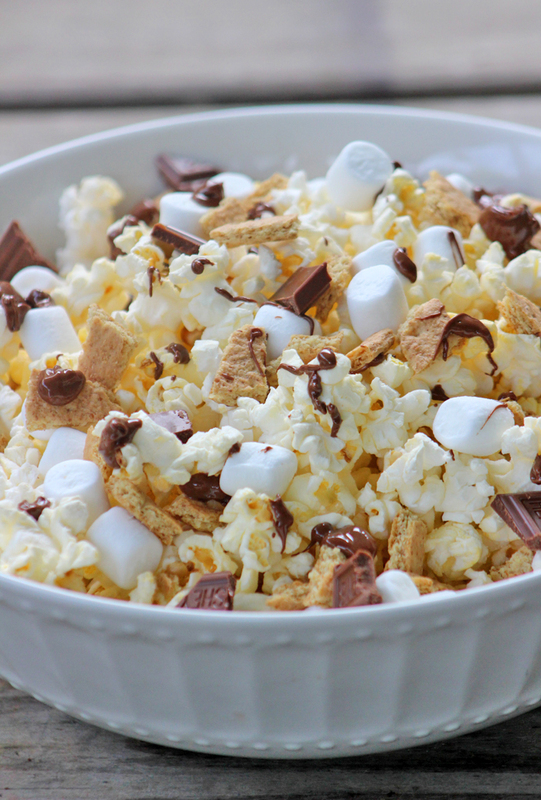 I present to you S'mores Popcorn! Honey Graham Crackers broken up into several small pieces. 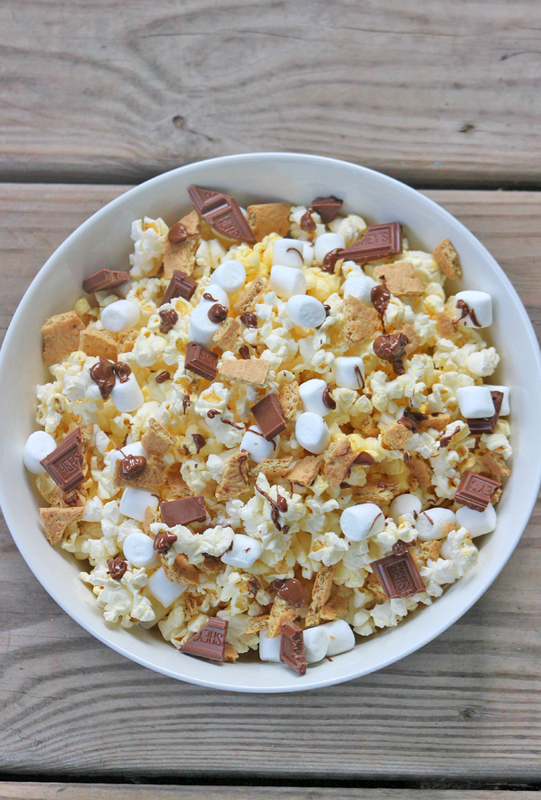 Add popcorn, mini marshmallows, graham crackers and whole pieces of candy first. Then at last drizzle chocolate over entire mixture. 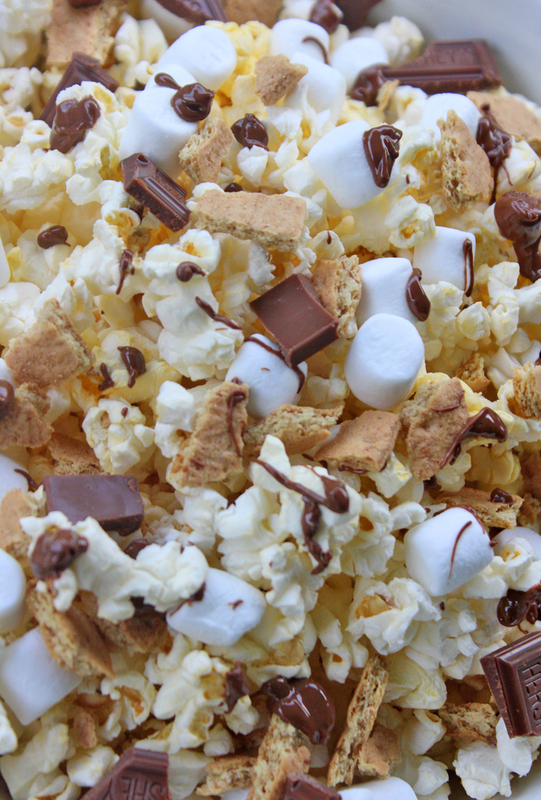 It's the perfect combination of a sweet and salty snack. It really is such a delightful and easy treat to make. 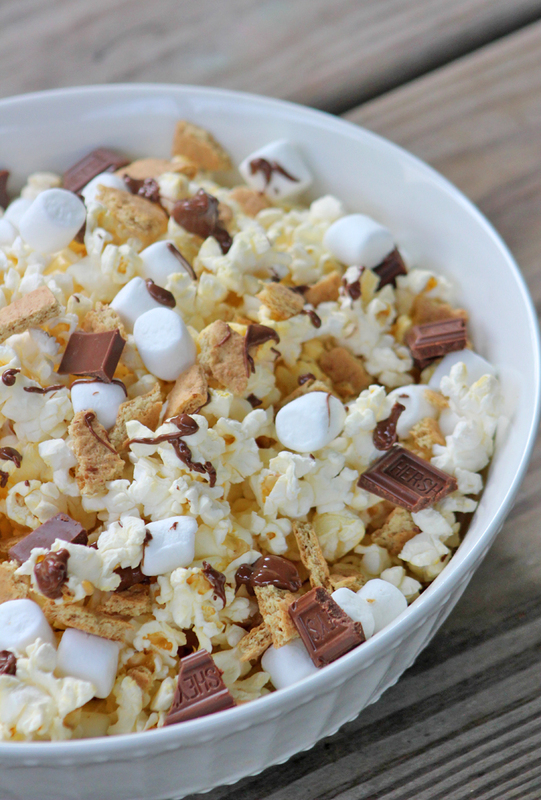 It's the perfect party mix. 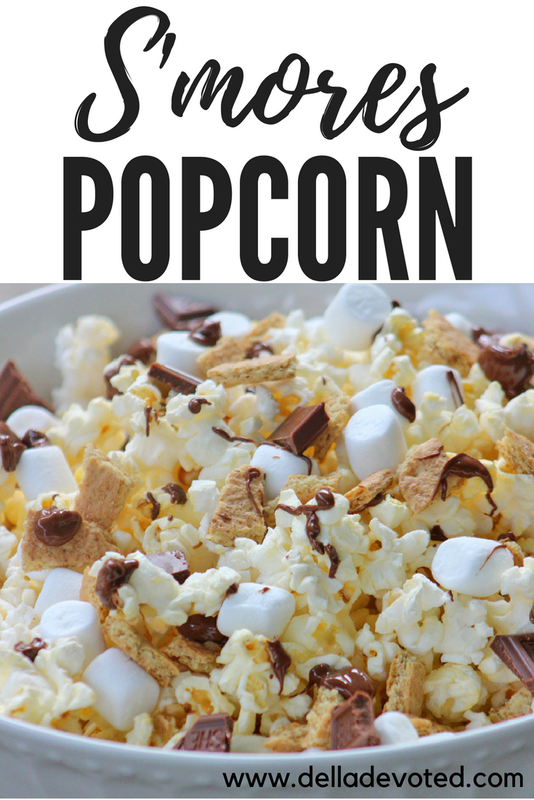 This snack will be great for any occasion or just to munch on at home. 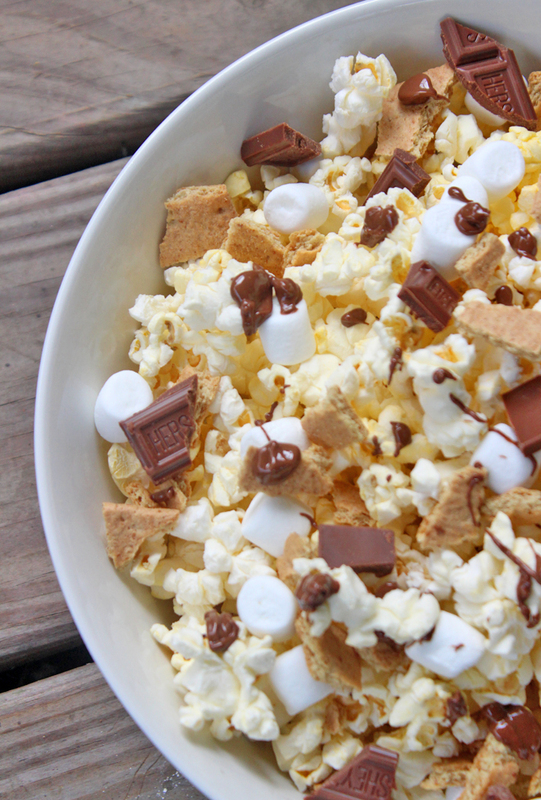 S'mores or Movie Nights will never be boring again! 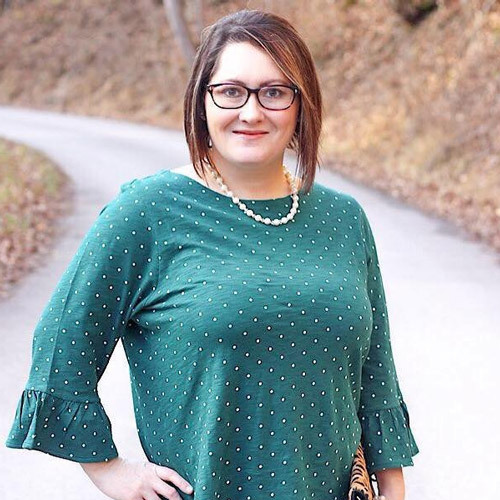 I love styling my look to match the seasons! 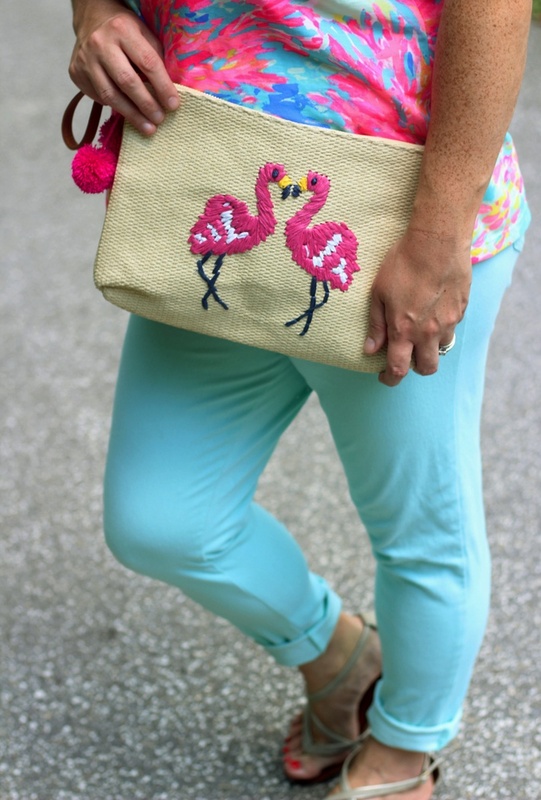 When I think of Summer, I am reminded of bright cheerful colors. 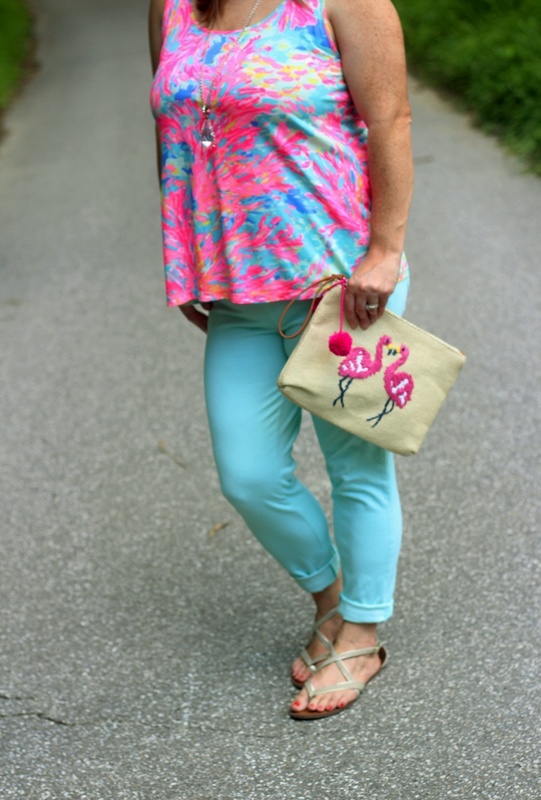 Mostly colors that remind me of the beach, so hot pinks, blues and greens come to mind. 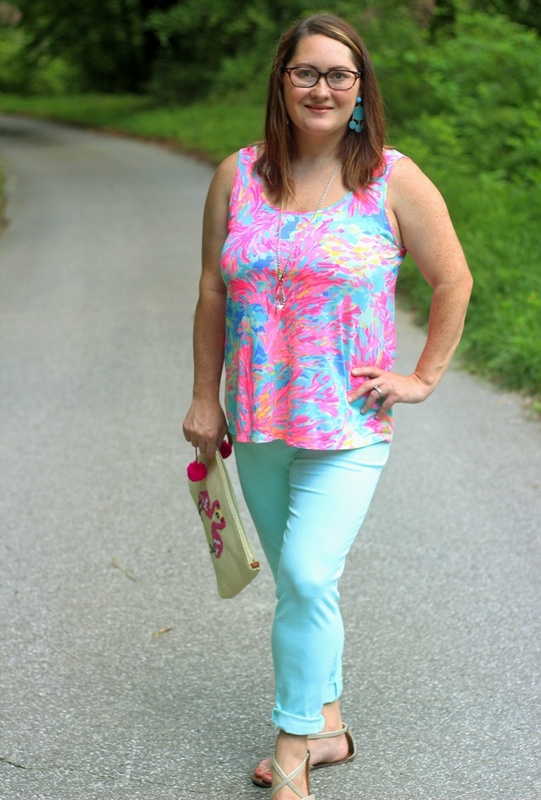 Bright colors always cheer me up, so whenever I'm having a bad day I like to get myself dressed up in bright bold colors. Lately I have been down and out because my baby will be starting school next week. I know all you momma's feel me when I say it's very hard to let go of your baby. I'm so excited to see all that he will learn and do, but my heart is breaking at the same time because my baby is not so little anymore. It's just bittersweet. Anyway, this outfit is the perfect pick me up look and it's one that I feel like I can be productive in and get things accomplished. Do you have an outfit like that? No use in wallowing in self pity, get yourself dressed and take on the day. I'm a firm believer that a good outfit can change your mood completely and cheer you up. 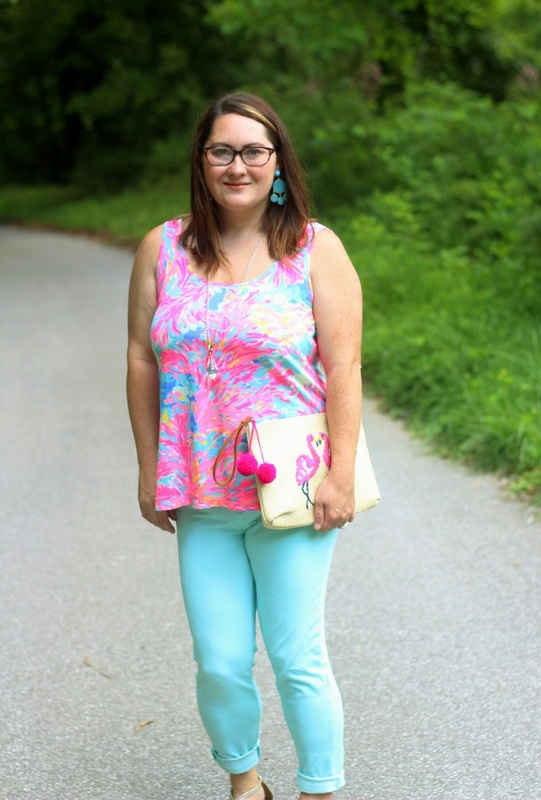 Throw in some colorful accessories too and have yourself a great day! 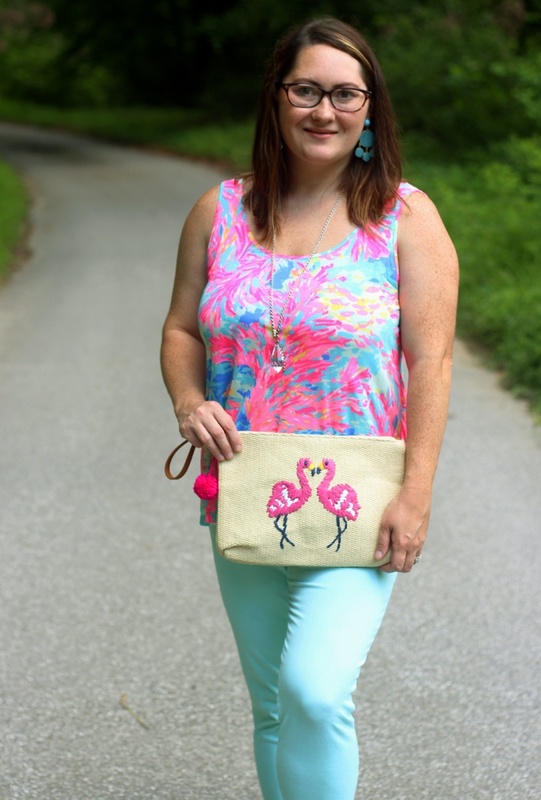 So here is to many more cheerful outfits before Summer ends. 1) Sunday was such a great and relaxing day for my little family. 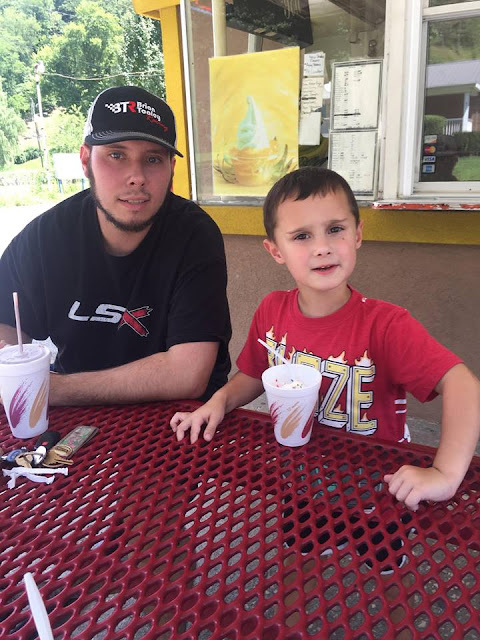 After church, Justin took Raylan and I out to dinner and then for ice cream at our favorite local ice cream shop. Then we swam the rest of the evening and got caught up on our Netflix shows. I love days like that! They rarely happen so when they do I take full advantage of them. 2) This has been a fun week for giveaways. I won two Facebook giveaways. I was so excited and shocked because I Very rarely ever win anything. 3) I scored a letter board at Family Dollar for only $8. I've been wanting one for a long time. I love finding a great deal. Now I can decorate the house with some adorable sayings. 4) Some church friends gave me some pumpkin spice coffee, latte and cappuccino k-cups because they know my love for all things pumpkin spice. I'm getting myself ready for Fall! I can't wait! 5) Raylan got the most adorable hair cut ever this week. Now he is almost ready for school to start. I still can't believe my baby is old enough for preschool. Where does the time go? 3) White Blouse and Kick Flare Jeans by Cheryl from Cheryl Shops.